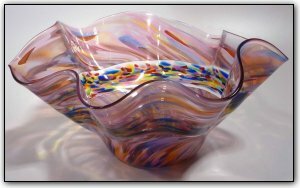 This 3 section incalmo fluted bowl is from the Signature End Of Day® series, meaning it is made with a variety of colors used throughout the day and contain nearly every color in the rainbow. The inner and outer sections feature a softer mix with more pronounced pinks, while the middle section features a more bold color mix. But what sets this bowl apart from other bowls in the End Of Day® series is the fact that its incalmo and has 3 separate sections. Incalmo is an extremely complex technique where each section is made separately and then they are joined one at a time while the glass is still hot.